Passover is brought to new life in Hutchinson Courtyard. 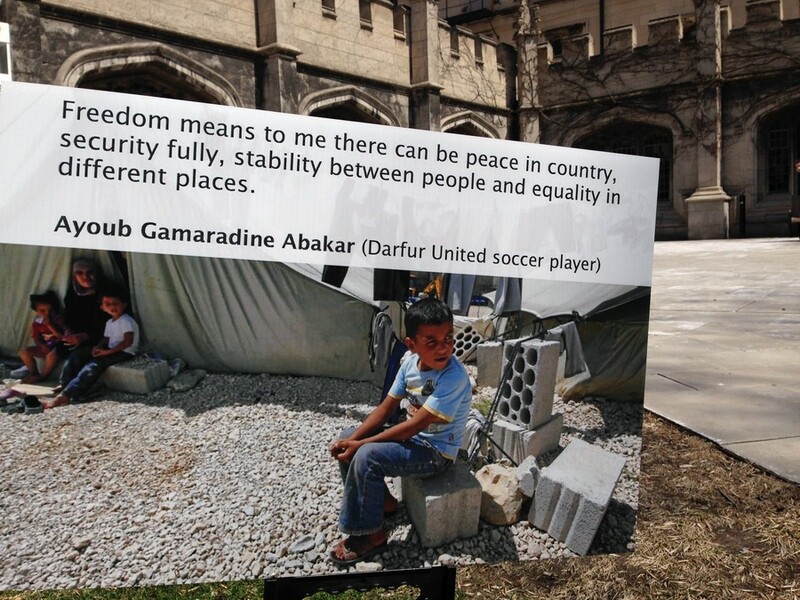 If you’ve walked through Hutchinson Courtyard this week, you may have seen a series of signs with thought-provoking quotes, pictures, and a question: What does freedom mean to you? While the question is inherently important, the reason why it is being asked now, and in this way, is perhaps even more profound. In an effort to connect a very personal tradition and history with the present, UChicago’s Hillel sponsored The Freedom Project during the holy week of Passover. “We wanted to invite people to think about how the Passover story is still relevant in our lives today and how we can take what we’ve learned in the Passover story and make it meaningful,” said second-year Francesca Freeman, an intern for Ask Big Questions. Hillel: The Foundation for Jewish Campus Life is an international organization that has a thriving presence on campus, hosted in the Hillel center on Woodlawn. UChicago’s center was founded in 1940 and was actually one of the first in the country, going on to host the first of the now-famous and frequently replicated Annual Latke-Hamantash Debate. This week, Jewish students and faculty alike are celebrating Passover across campus. Passover is a key Jewish holiday that commemorates the Exodus, the Israelites’ liberation from slavery in Egypt as written in the Old Testament. Practicing Jews celebrate by abstaining from leavened bread and participating in Seders, ritual tellings of the story combined with a symbolic meal. Passover is a cultural and spiritual event deeply rooted in the tradition and history of a people and faith. However, the installation in Hutch Courtyard is making an effort to allow that tradition to expand beyond its historical image and stimulate conversation about the modern day. UChicago’s chapter of Ask Big Questions, a Hillel initiative, created the project as part of a larger mission: to create opportunities to discuss topics that transcend divisions among mankind and foster common ground and understanding. The group consists of several hardworking interns who inspired and created the collection of signs, as well as manned the indoor table where they gathered students’ responses to the big question they were asking. In order to get a full representation of different thoughts on this elusive and philosophical question, the group reached out to refugees in Chad to hear what freedom meant to people who were seeking it so desperately. A quote from one of the refugees was featured alongside words from Einstein and other great thinkers. David Korenthar, the Engagement Associate at Hillel who oversaw the project, said, “Freedom means so many different things to different people.” And in true UChicago spirit, students took the initiative to start understanding a question much bigger than themselves by looking at it through different perspectives, with patience, open discussion, and honesty.